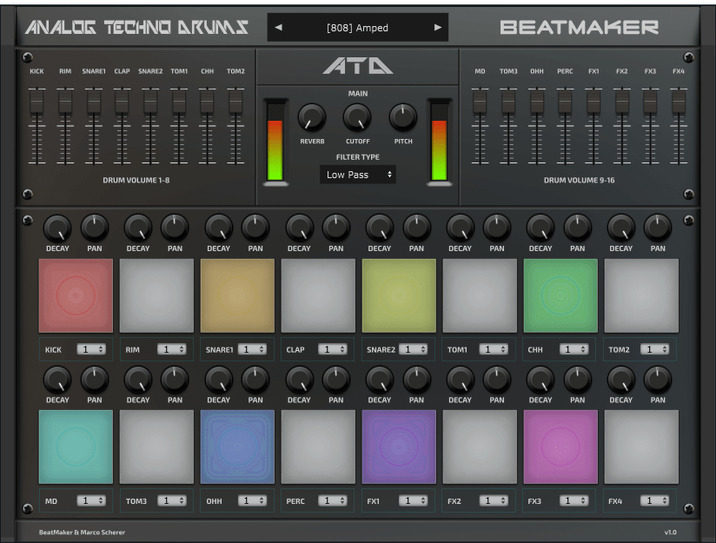 Analog Techno Drums is a VST/AU Plugin for Windows and macOS, instantly providing 66 drum kits for Electro, Techno, Detroit, Minimal, Acid and Other styles that need punchy drums with character. The 1056 drum sounds are a compilation of the Drum Depot packs Analog 808, It’s Drums, It’s Drums II and Motor City by Marco Scherer. The kits come with inspiring and ready to go patterns and are mapped in General Midi standard. Pan and Decay on each drum channel. Available as a VST/VST3 & AU instrument for Mac (32 bit/64 bit). Reason 10 & Apple Logic Pro.